A choose your own adventure story to end them all, Meanwhile boasts 3,856 story possibilities that spring from Jimmy's simple choice of getting vanilla or chocolate ice cream. Following the story across multiple panels connected by arrows and tubes across pages, the reader can choose what happens next. Most paths lead to "DOOM and DISASTER," according to the introduction, with only one path leading successfully home. The fun comes in figuring out which choices lead where. The stories I have seen so far have been very creative, involving the choices that come from meeting Professor K, a scientist with fantastic inventions. One allows a person to travel 10 minutes back in time. Another allows a person to read the last 10 minutes of someone's thoughts. The last one, the Killitron 2000, kills every living being on Earth that is not safely enclosed in its cabin. Getting the choice to use all of these devices leads to some pretty interesting, often funny, outcomes. 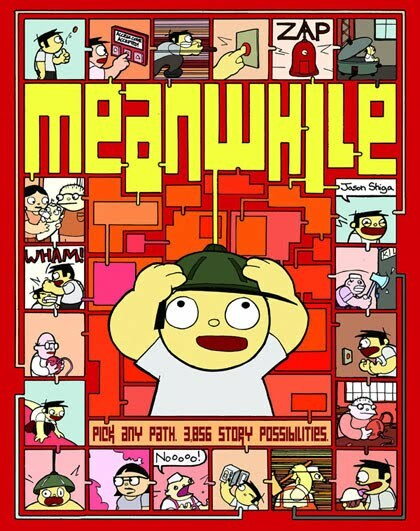 Writer-creator Jason Shiga is renowned for including mazes and puzzles in his work, and his unconventional stories have appeared in McSweeney's Quarterly and Nickelodeon Magazine. He has been nominated for multiple comics awards and won the 2003 Eisner Award for Talent Deserving of Wider Recognition for his comic, Fleep. More information about Shiga's life and career can be found here. To get an idea of how much time and thought went into Meanwhile, check out this picture of the book laid out in matrix form. This interview sheds more light on his work on the book and this video interview with Shiga describes how it can be read. The interactive features have lead many to praise the book. Travis Jonker wrote that the book should appeal to "puzzle solvers, mathematicians, and the scientific-minded" who love to solve riddles. A reviewer at The School Library Journal called it "one of the most original titles I've ever encountered" while also providing a bevy of related links at the bottom of their page. Wired's GeekDad Jonathan Liu was so impressed with the book he's putting Shiga on his list of people to watch. Kirkus Reviews offer a slightly less enthusiastic response, noting some problems with a simple and circular plot but still admitting that "this clever book should amuse for hours." Meanwhile was published by Amulet Books. There is a short preview at Amazon.com, but it does not do justice to the book's format. The last time we met G-Man and Great Man, a pair of squabbling, super-powered siblings, and got to know a colorful cast of characters. In this volume, we get a larger story that grows out of older brother Great Man's desire to make more money than having a paper route. His scheme is to cut G-Man's magic cape into pieces and make them into bracelets. The cape is the source of their powers, and the bracelets give their wearers super-strength, invulnerability, and the ability to fly. Even at thousands of dollars apiece, people line up around the block to get a piece of that action. Great Man is not so stringent with a screening process, and some shady characters end up with superpowers and start causing mayhem. On top of that dilemma, the Wizard warns G-Man that breaking up the cape is making its magic highly unstable. This volume is the latest in a series by Chris Giarrusso, a veteran of Marvel Comics whose funny and cartoony style is very expressive. This interview about his work and career details some insight into Giarrusso's stories. An interview with Comic Book Resources specifically about this series is available here. 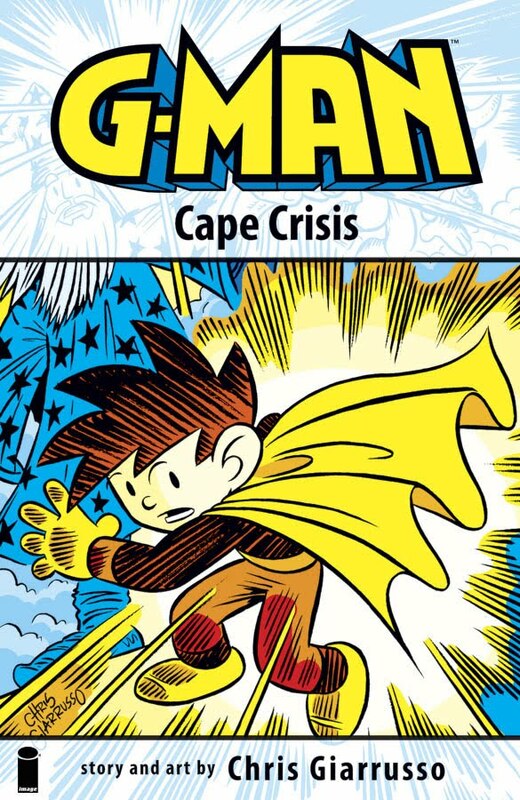 Reviews of Cape Crisis have been largely positive, among readers young and old. Robert Sodaro praised the book, stating that it contains "so much of why we read comics in the first place." 10 year old Sophie Wilson at the Graphic Classroom found the story and art incredible. Raoul at Trade Talks was "tempted to end this review in one paragraph, telling you to just buy it already." Cape Crisis was published by Image Comics, and an extended preview is available here. A video preview is also available here. 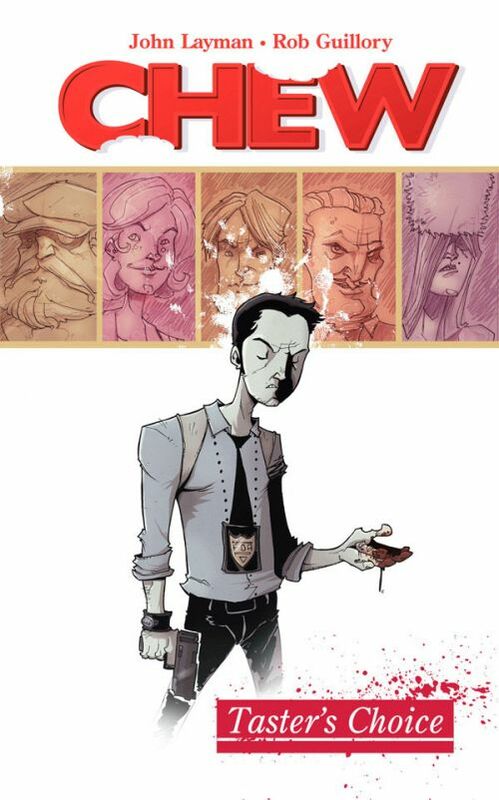 Chew is a surprise hit comic book series that began in 2009. It stars detective Tony Chu who harbors a secret: he is a cibopath, a person who can get psychic impressions from whatever he eats. When he eats an apple he can tell what pesticides were used on it as well as when it was harvested. When he eats meat he gets more gruesome images, including how the animal was raised and how it was slaughtered. Because of his abilities, he tends to eat little but the only food he gets no impression from, beets. Detective Chu's abilities lead him down a bizarre, disgusting career path to being a special agent for the FDA. It turns out that his abilities come in quite handy when he ingests part of a victim or suspect and can get a picture as to how crimes have played out. He gets assigned to using cannibalism to clean up a large backlog of open and cold cases as well as track down chicken smugglers. This story takes place in an alternate history where bird flu has lead to outlawing all poultry and a black market and "chicken speakeasies" have cropped up. All of this should seem extremely outlandish yet the story coalesces into a compelling and well-plotted narrative. Chew is written by John Layman, a comic book writer and letterer whose main credits before this series were on X-Men and various crossover comics. Layman offers some insight into his plans for the series in this article. Rob Guillory draws the book in a very cartoony style, with small details and jokes in the backgrounds, yet he also grounds the art in a type of realism. He won the 2010 Harvey Award for Best New Talent, and he comments on his drawing process in this article. This quirky book won the Eisner and Harvey Awards for best new series and also has received its share of praise. Ryan Schrodt called this "must read" book a good mix of "disturbing" and "fun." David Samuelson commented on the mix of adventure, action, gross out scenes, surrealism, and humor working very well together. Nick Roberts cautions that the book might not be to everyone's taste, but he wrote that "Tony Chu is a great character, the story is great if a little off beat and I’m looking forward to continuing the adventure" in later volumes. This book is published by Image Comics and a preview is available here. Not so much a graphic novel as a collection of cartoons from Reason Magazine, this book is full of the excoriating wit of Peter Bagge. Bagge has been cartooning since the 1980s, with work frequently appearing in the seminal comics anthology Weirdo. He went on to his own anthology series Neat Stuff, where he drew and wrote stories about suburban families, talk radio DJs, and assorted social misfits, which led into Hate, a series that followed Buddy Bradley as he moved from suburban New Jersey to grunge-era Seattle. His work is highly regarded, and he has won multiple Harvey Awards for his art and writing. In this collection, Bagge voices his libertarian views to skewer many topics, from political machinations of war, debates over legalizing marijuana, the mall-ification of America, public funding of professional sports complexes, public funding for art, casino gambling, and funding public transportation. He attacks the political right and left, even his own Libertarian Party. Often, he places himself in the story, as a reporter from a swingers convention or a War on Drugs conference and acts as an average Joe, probing into the ridiculous or shaky underpinnings of political stances and opinions. Although not every topic in the book is appropriate in school, an instructor could find many great examples to cherry-pick for instructional use. All of the reviews I've read about this book show an appreciation for Bagge's loopy art style but also have some reservation about his opinions. Robot 6's Chris Mautner wrote that whether you agree with his views or not, Bagge is "still one of the funniest cartoonists in America today." Esquire's Tim Hefferman opined that the book is as "combative, iconoclastic, and embittered as its title suggests it would be. It is also smart, thought-provoking, and funny as hell." Ashley Cardiff offers a contrasting opinion of the book, eviscerating Bagge's libertarian views. All said, it seems that the book has the potential to amuse and agitate, an indication Bagge did his job well with these cartoons. Here is a preview from the collection's publisher Fantagraphics Books. Most of the cartoons featured in the book can be found on Reason's website if you search for them by title. Chad, Iraq, Lebanon, Somalia, Afghanistan, and East Timor might not be ideal travel spots for many but David Axe is a "war tourist" and journalist who is working to depict the victims and conditions from world conflicts. He publishes his work in a number of forums, including the War is Boring blog, columns at World Politics Review, and Wired's Danger Room. He does not have an official page, but he has served as a war correspondent for numerous outlets, including C-Span and BBC Radio, and his bio can be found by scrolling down this info page. 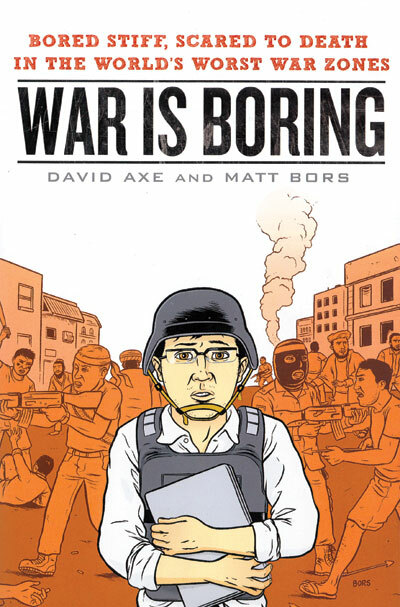 War is Boring gives us short chapters on his visits to these global hot spots, interspersed with stories from the US, with Axe trying to maintain personal relationships with his friends and family while being absent for long periods of time. We get snapshots of each place, not the extended or multiple viewpoints found in Joe Sacco's work, for example. The effect is a series of vignettes that tend to run together as well as a view into Axe's seemingly pathological and self-destructive tendencies to place himself in danger. I got as small sense of political situations but a larger sense of the personality of a war correspondent. Conveying such a personal portrait in the context of these global conflicts makes for an interesting, provocative juxtaposition. War is Boring is the combined effort of two political activists. David Axe's views about his work here are explored in this interview with Noah Shacthman. Matt Bors, who provided the art, is a nationally syndicated editorial cartoonist who creates the webcomic Idiot Box and comments on his work via his blog. His style is realistic with a cartoon edge, and he is adept at capturing people's emotions through facial expressions. 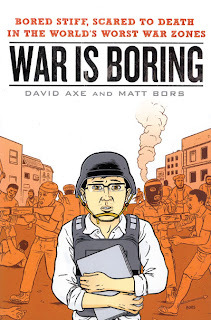 This interview with Tom Spurgeon casts more light on Bors's work on this book and beyond. Reviews of this graphic memoir have been mostly positive, pointing out the effectiveness of the personal spin on world issues. Publishers Weekly (free registration needed to access reviews) noted that the book "suffers a bit from Axe's ambivalence toward his calling, but his honesty sets it apart from other war narratives." Kirkus Reviews called it "powerful" and "elliptical," highlighting the questions it raised about whether war is a constant state of humanity. Brett Schenker called it a "great read." A video preview and more information about the book and creators can be found here from the publisher New American Library.